Six and a half months into the new Rule of Francis, among other patterns to emerge is that, when the Pope gets excited, he likes to "load the cannon." One earlier example of this came on 5 July, when – within a matter of hours – Papa Bergoglio released his first encyclical (a work "of four hands" with his predecessor), announced the canonizations of John XXIII and John Paul II and made his first joint public appearance with B16. And now, on the day that he formally set next 27 April for the first sainting of two Popes at once, announced his oft-used theme of building a "culture of encounter" as the focus of the next World Communications Day – and with the all-important summit of what's now officially in business as the "Council of Cardinals" opening in the morning – an already full news-cycle will reportedly soon see an added dose of chaos: namely, another interview. The Pope's second on-the-record conversation to emerge in 11 days, a notice late tonight on the website of Italy's largest daily, La Repubblica, announced the imminent publication of an interview with Francis conducted by the paper's co-founder, the atheist Eugenio Scalfari, long a significant figure of the Italian Left. 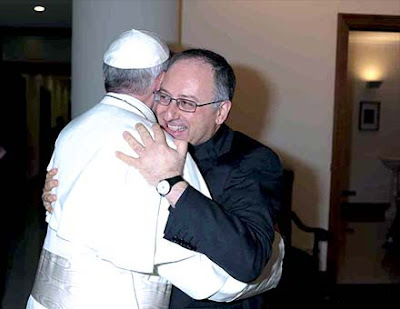 It's not the first interaction between the two; a July letter Scalfari sent to Francis was replied to by the pontiff in an extensive op-ed for the paper earlier this month. The news was likewise relayed in a midnight tweet from the daily's editor, Ezio Mauro. 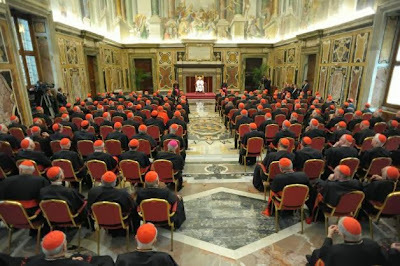 While no text of the sit-down has appeared of yet, La Repubblica's headline of the article reads: "Thus I will change the Church" ["Così cambierò la Chiesa"], with a subhed quoting Francis that "'To open oneself to modernity is a duty.' The Pope's plans for reforming the Curia." However, as the "get" was prefaced by the words "in edicola" – "on newsstands" – it may be the case that the exchange's initial run is held exclusively for the paper's print edition. Even if the inaugural meeting of the "Super 8" and the scheduling of the joint canonization have already drawn a renewed heavy spotlight on the Vatican this week – one bound to only increase with another papal interview – the events of these hours are merely Francis' prelude to what's set to be a very dramatic, intense moment: the Pope's daylong Friday visit to Assisi to mark the feast of the saint whose name he bears, his counselors duly in tow and with no less than six speeches planned. As ever, more when it hits. 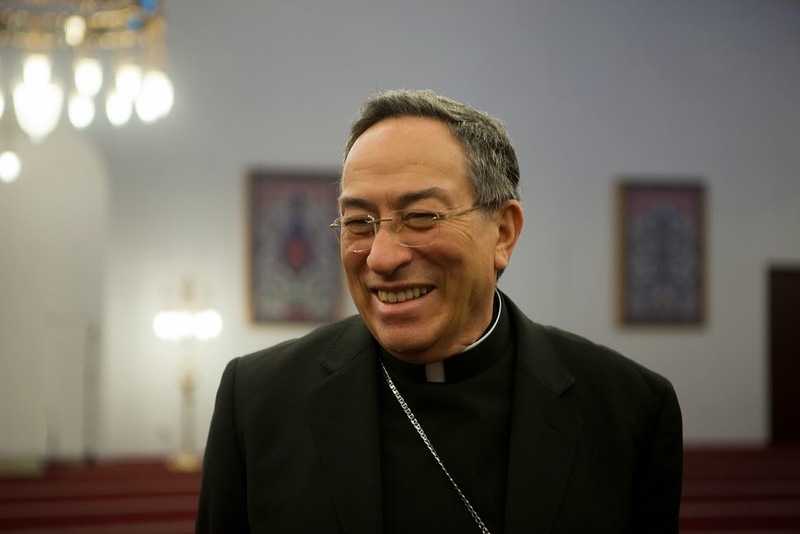 Two years ago, Óscar Rodríguez Maradiaga was licking his wounds on the Roman scene. After a power play orchestrated by the Roman Curia, the Honduran cardinal's top collaborator at Caritas Internationalis – the charity confederation's secretary-general, Lesley Anne Knight – had been denied a second term by the Vatican, for reasons that the Caritas board wouldn't disclose, but greeted with stated "incomprehension." Widely seen as the most formidable laywoman in a global-level church post, Knight's allies later portrayed the British-Zimbabwean chief's black-balling in the context of her gender, lack of orders and outspokenness at high levels in defending her agency's work. 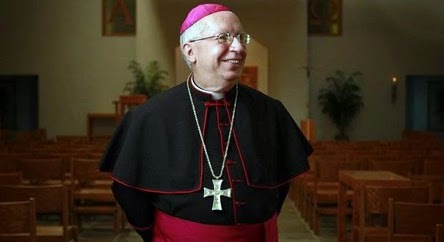 Yet now, as only a transition of Popes can bring about, it's suddenly a new world: Cardinal Tarcisio Bertone, the Salesian confrere with whom Rodriguez shared little else in common, is 17 days from retiring... and this week, the Honduran's restoration to center stage (and then some) completes itself as Don Óscar takes the principal place alongside Pope Francis at the first summit of Bergoglio's advisory commission of eight cardinals as the group's designated "coordinator." Believed to have been the key driver behind the Latin American bloc that put the Argentine on this Conclave's map in the first ballot, it's not a stretch to say that Rodríguez, 70 – a dynamic polyglot with three decades' experience on the global stage – now enjoys the role of papal "shadow," and the near-limitless portfolio that comes with it, which in times past had been the province of the Secretary of State. Indeed, unburdened with the minutiae of running a dicastery as he cris-crosses the globe, perhaps it isn't even too much to cast the first of the "Super-Cardinals" as Francis' "Vice-Pope"... at least, with one key difference from before: unlike the Benedict-Bertone tag-team, the new Pope has no qualms about being his own linebacker. Earlier this week, Rodríguez popped up North of the Border for the Canadian bishops' Fall Plenary, both to address the bench on the responsibility of charity in their ministries, and in a closed-door session (said to have been marked by "excitement"), to take the prelates' temperature on the state of the Curia and their proposals for its reform. In an earlier sit-down with the network during the CCCB plenary, Rodríguez likewise pointed anew to the apparent centerpiece of Francis' Curial reform with his declaration that "The Synod [of Bishops] will be transformed." 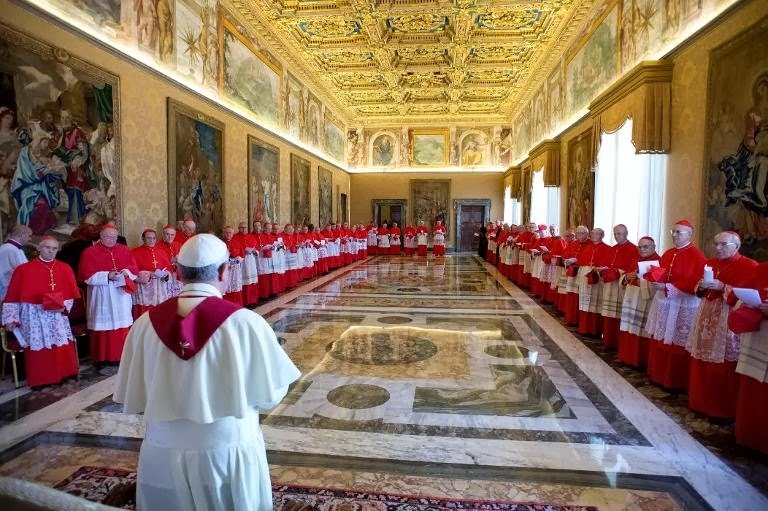 While the "Gang" members have remained in frequent contact both amongst themselves and with the Pope since the council's constitution in April, early expectations are that the group will gather with Francis on a quarterly basis; the path forward will reputedly be set in stone at this week's summit. In announcing a Monday briefing on the upcoming summit, the Vatican prodded journalists to keep in mind that "the Group is constituted to offer advice to the Pope, and not to take decisions per se." 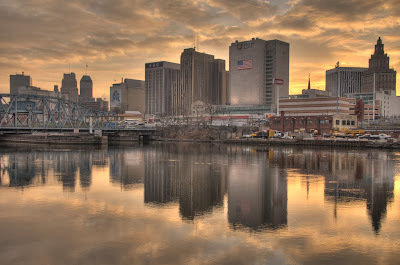 Good Saturday morning, folks, and Happy Weekend. As the last few days have proven more intense than expected, and just ahead lies what's shaping up to be the most significant week of this pontificate to date, for now, let's put things on a lighter note – at least, of sorts. 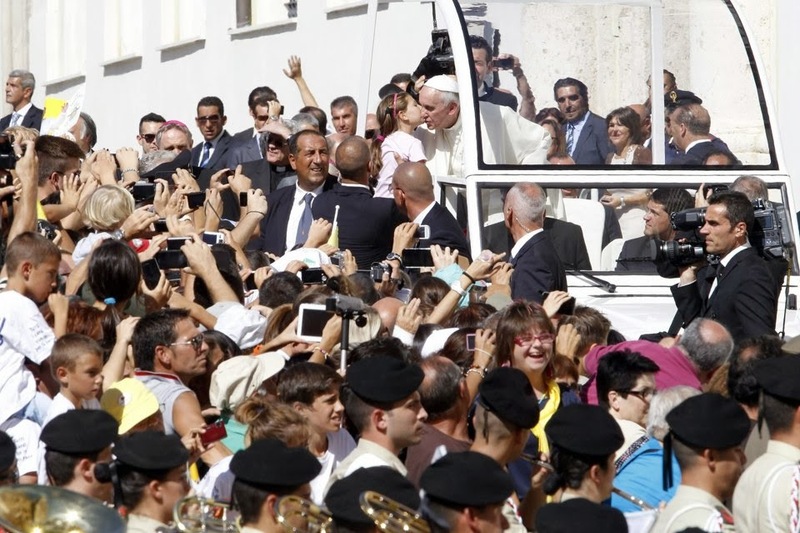 First, though, an observation: much as the papal security team's working overtime these days, there's a second group of staffers whose load has increased exponentially since 13 March – namely, the translators. Sure, having un Papa Chiacchieron' who can "flood the space" is a boon for getting the message out, but given Francis' steady stream of words – and even more, the Pope's penchant for shredding his prepared (and already-translated) texts by either adding a host of unscripted asides or veering into a full stream-of-consciousness talk – keeping up is no mean task. 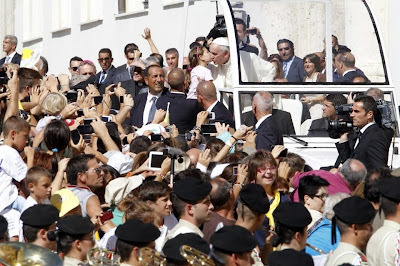 Along those lines, one talk that stuck out among the recent raft was Francesco's reflection to a mass rally for young people at the close of last Sunday's trip to Sardinia, before which a group of youth put questions to the Pope. Accordingly, the visitor spontaneously worked in some answers – which produced some rather brow-raising quotes – but most of all, it made for a useful and hopeful message easily able to apply to pastoral life in places far beyond the Mediterranean island. It seems as if there are a few young people, doesn’t it? A few or many? [Crowd cheers.] There are lots of you! Thank you for coming to this meeting in such large numbers! And thank you to the “spokespeople”. Seeing you reminds me of the World Youth Day in Rio de Janeiro. Perhaps several of you were there, but many must certainly have followed it on television and on the internet. It was a very beautiful experience, a celebration of faith and brotherhood that filled one with joy. The same joy that we feel today. Let us thank the Lord and the Virgin Mary, Our Lady of Bonaria: it is she who has enabled us to meet here. Pray to her often, she is a good mother, I assure you! Some of your “queries”, your questions [were hard to understand]... but I also speak in dialect, here too! Some of your questions are similar. I am thinking of the Gospel by the shores of the Sea of Galilee, where Simon, who Jesus was later to call Peter, and his brother Andrew, together with James and John, also brothers, all lived and worked as fishermen. Jesus was surrounded by the crowd who wanted to listen to his word. He saw those fishermen mending their nets beside the boats. He climbed on to Simon’s boat and asked him to put out a little from the shore. So it was that he spoke to the people sitting in the boat; Jesus addressed the people from the boat. When he had finished, he told Simon to put out into the deep and let down his nets. This request was a “trial” for Simon — you know the word: a “trial” ["una prova": a test] — for he and the others had just come back from fishing all night with nothing to show for it. Simon was a sincere and practical man, and he immediately said to Jesus: “Master, we toiled all night and took nothing”. This is the first point: the experience of failure. In your questions there was this experience: the sacrament of Confirmation, — what is this sacrament called? Confirmation... No! Its name has changed: the “sacrament of farewell”. They do this and then they leave the Church. Is this true or not? This is an experience of failure. The other experience of failure: young people aren’t in the parishes: you yourselves have talked about this. This experience of a failure, something that goes wrong, a disappointment. Youth looks ahead, but at times it happens to experience failure, some frustration. This is a trial and it is important! And now I want to pose a question to you; however, do not reply out loud but in silence. May each one one of you think in his or her heart, think of your own experiences of failure, think about them. It is certain: we all have these experiences, we all have them. We very frequently have this experience in the Church: priests, catechists, and animators tire themselves out, they spend so much energy, they put everything into it, and in the end they do not always see results that correspond to their efforts. Your “spokespeople” also said this in their first two questions. They referred to the communities where faith seems somewhat faded, where few of the faithful take an active part in the life of the Church, Christians are seen who are sometimes weary and sad and many young people move off after receiving Confirmation. The sacrament of farewell, of goodbye, as I said. It is an experience of failure, an experience that leaves emptiness and discourages us. Is this true or not? [Crowd responds "Yes"] Is it true or not? [Crowd "Yes"]. In the face of this situation you are right to wonder: what can we do? Of course one thing is to let oneself be overcome by pessimism and distrust. Pessimistic Christians: how awful! You young people can’t and mustn’t be lacking in hope, hope is part of your being. A young person without hope is not young but has aged prematurely! Hope is part of your youth! if you don’t have any hope, think seriously, think seriously.... A young person without joy and without hope is upsetting: he is not young. And when a young person has no joy, when he lacks confidence in life or loses hope, where can he go to find a bit of tranquillity, a bit of peace? Without trust, without hope and without joy? You know, the merchants of death, these merchants that sell death, offer you a way out when you are sad, when you are without hope, without trust and disheartened! Please don’t sell your youth to these people who sell death! All of you know what I’m talking about! You have all got it: don’t sell! 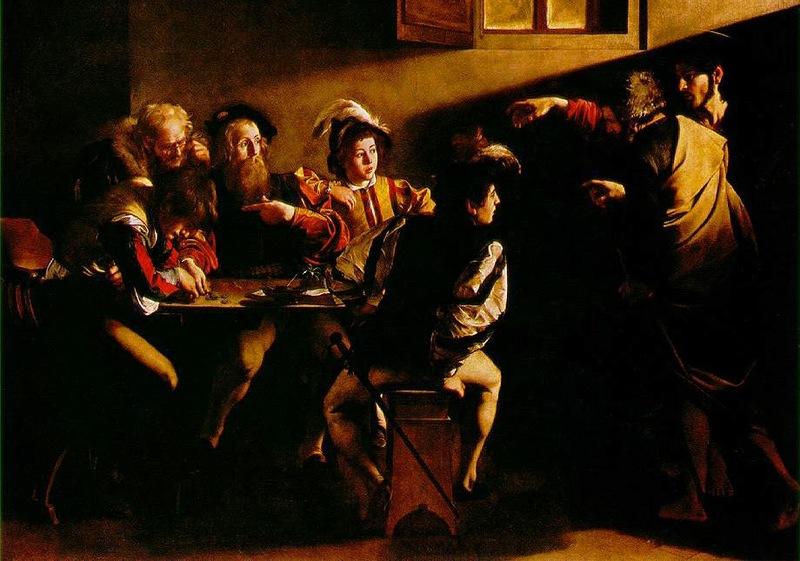 Let’s return to the scene of the Gospel: Peter, in that critical moment, takes a risk. What could he have done? He could have given in to weariness and to discouragement, thinking that it is pointless and that it is better to withdraw and go home. Instead, what does he do? With courage, he steps out of himself and decides to trust Jesus. He says: “Well, alright! At your word I will let down the nets”. Be careful! He does not say: at my strength, my calculations, my experience as an expert fisherman, but rather “at your word”, at the word of Jesus! And the result is an incredible catch, the nets are filled to the point that they almost tear. This is the second point: trusting Jesus, trusting Jesus. And when I say this I want to be sincere and to tell you that I do not come here to sell you an illusion. I come here to say: there is a Person who can keep you going, trust in him! It is Jesus! Trust in Jesus! And Jesus is not an illusion! Trust in Jesus. The Lord is always with us. He comes to the shores of the sea of our life, he makes himself close to our failures, our frailty, and our sins in order to transform them. Never stop staking yourselves on him, over and over again, as good sportsmen — some of you know this well from experience — who can face the strain of training in order to achieve results! Difficulties must not frighten you but on the contrary spur you to go beyond them. Hear Jesus’ words as though they were addressed to you: put out into the deep and let down your nets, young people of Sardinia! Put out into the deep! Be ever more docile to the Lord’s word; it is he, it is his word, it is following him that brings to fruition your commitment to witnessing. When your efforts to reawaken faith in your friends seem to be in vain, like the nocturnal efforts of the fishermen, remember that with Jesus everything changes. The word of the Lord has filled the nets and the word of the Lord makes the missionary work of his disciples effective. Following Jesus is demanding, it means not being satisfied with small goals of little account but aiming on high with courage! It is not good — it is not good — to stop at “we took nothing”; rather, go further, to “put out into the deep and let down your nets”, once again, and without tiring! Jesus repeats this to each one of you. And it is he who will give you the strength! There is the threat of complaining or of resignation. Let’s leave these epithets to the followers of the “goddess of lamentation”. And you, are you following the “goddess of lamentation”? Are you continuously wailing as in a funeral wake? No, young people can’t do that! The “goddess of lamentation” is a deception: she makes you take the wrong road. When everything seems to be standing still and stagnant, when personal problems disturb us and social hardships do not meet with the right responses, it is not good to consider oneself vanquished. Jesus is the way: get him to embark on our “boat” and put out into the deep with him! He is the Lord! He changes the prospect of life. Faith in Jesus leads to a hope that goes further, to a certainty based not on our qualities and skills alone, but on the word of God, on the invitation that comes from him. Without making too many human calculations and without worrying about checking whether the situation that surrounds you coincides with your points of security. Put out into the deep, go out of yourselves: go out of our small world and open ourselves to God, to open ourselves increasingly also to our brethren. Opening ourselves to God is opening ourselves to others. Take a few steps outside ourselves, little steps, but take them. Little steps, going out of yourselves toward God and toward others, opening your heart to brotherhood, to friendship and to solidarity. Third — and I conclude; [this] is somewhat lengthy! “Let down your nets for catch” (v. 4). Dear young Sardinians, the third thing I want to tell you, and in this way I am answering the other two questions, is that you too are called to become “fishers of men”. Don’t hesitate to spend your life witnessing joyfully to the Gospel, especially among your peers. I want to tell you of a personal experience. Yesterday I celebrated the 60th anniversary of the day when I heard Jesus’ voice in my heart. I am not telling you this so that you will make me a cake here, no, that is not why I’m saying it. However, it is a commemoration: 60 years since that day. I will never forget it. The Lord made me strongly aware that I should take that path. I was 17 years old. Several years passed before this decision, this invitation became concrete and definitive. So many years have gone by, with some successes and joys but so many years with failures, frailties, sin... 60 years on the Lord’s road, behind him, beside him, always with him. I only tell you this: I have no regrets! I have no regrets! Why? Because I feel like Tarzan and I feel strong enough to go ahead? No, I have not regretted it because always, even at the darkest moments, the moments of sin and moments of frailty, moments of failure, I have looked at Jesus and trusted in him and he has not deserted me. Trust in Jesus: he always keeps on going, he goes with us! However, listen, he never let us down. He is faithful, he is a faithful companion. Think, this is my witness: I am glad about these 60 years with the Lord. However, something more about moving ahead. Have I gone on for too long? [Crowd: "No!"]. Let’s stay united in prayer. And journey on in this life with Jesus: the saints did it. Saints are like this: they are not born perfect, already holy! They become so because, like Simon Peter they trust in the word of the Lord and “put out into the deep”. Your land has contributed so many witnesses and recently too: the Blesseds: Antonia Mesina, Gabriella Sagheddu, Giuseppina Nicoli; the Servants of God: Edvige Carboni, Simonetta Tronci and Fr Antonio Loi. They are ordinary people who instead of complaining “let down their nets for a catch”. Imitate their example, entrust yourselves to their intercession and always be men and women of hope! No complaining! No discouragement! Never be depressed, never go to purchase comfort from death: none of it! Go forward with Jesus! He never fails, he never disappoints, he is loyal! Pray for me. And may Our Lady go with you. Thank you all for being here today. I see exhaustion in your faces but I also see hope. Feel loved by the Lord and also by many good people who aid and alleviate their neighbour’s suffering with their prayers and action. I feel at home here. And I also hope that you feel at home in this Cathedral, as we say in Latin America: “this home is your home”. It is your home. Indeed, it's a new opening for the church... as for seeing it borne out at "ground level," well, we can only hope. “The doctrine of the law is enriched with Jesus and that ‘Jesus makes all things new.’ The law allows you to hate the enemy, instead Jesus says to pray for him, to not hate him. This, then, is the Kingdom of God that Jesus preached. It is renewal, true renewal. And this renewal begins first of all in our heart. Being a Christian means being renewed by Jesus in this new life. I am a good Christian, every Sunday, I do this as if it were a collection. But the Christian life is not a collage of things. It's a harmonious whole, and the Holy Spirit does it. You cannot be a Christian in bits and pieces, part-time. It’s full-time. Being a Christian does not mean the end of things, but being renewed by the Holy Spirit, or, to use the words of Jesus, to become the new wine. The newness of the Gospel is a newness in the law itself which is inherent in the history of salvation. It is a newness that goes beyond us and renews structures. That is why Jesus said new wine needs new skins. 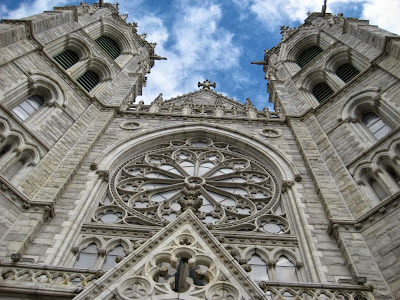 In Christian life, even in the life of the Church, there are ancient structures: it is necessary to renew them! And the Church has always been attentive to that, through dialogue with the cultures. Always renew according to places, times and people. ...and now, the much-sought, intensely awaited discernment undertaken before and since begins its full emergence to the fore. Established 30 days after his election with the expressed mandate "to advise him in the government of the universal church and to study a plan for revising the Apostolic Constitution on the Roman Curia, 'Pastor Bonus,'" as the members of Francis' "Gang of Eight" commission of cardinals begin the trek to Rome for their first meeting with Papa Bergoglio starting Tuesday – or possibly even earlier – for those who forgot, just be reminded at the outset that notice of the changes to come has already been served. Good Monday morning, Church – for all the thousand and more Rorschach test-results that've bloomed over the weekend, just do your intelligence a favor and Read It Again. 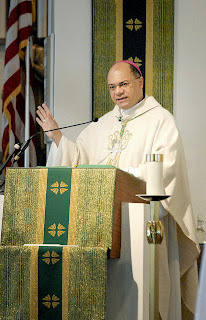 As the docket progressively returns to life after the summer lull, this Monday morning brings the third turnover of a Stateside see in five days: at Roman Noon, the Pope named Bishop Shelton Fabre, the 49 year-old auxiliary of New Orleans since 2006, to head the neighboring Houma-Thibodaux diocese, succeeding Bishop Sam Jacobs, who reached the retirement age of 75 last March 5. One of the few active American bishops who’s an alum of the late, lamented American College Louvain, the Baton Rouge-bred nominee has juggled double duty as a pastor and Chancery official both before and after his 2006 arrival as a NOLA auxiliary, and even after subsequently becoming the archdiocese’s lead vicar general/moderator of the curia. Warmly regarded and more on Louisiana soil, Fabre has kept a low profile on the wider scene, keeping with what friends have termed a “lovable” shyness. With today’s nod, six African-American prelates – besides Fabre, Bishops Terry Steib SVD of Memphis, Curtis Guillory SVD of Beaumont, George Murry SJ of Youngstown, Edward Braxton of Belleville, and the community’s preeminent leader, Archbishop Wilton Gregory of Atlanta – are now ordinaries of dioceses, with two remaining active auxiliaries: Bishops Joseph Perry in Chicago and Martin Holley in Washington. 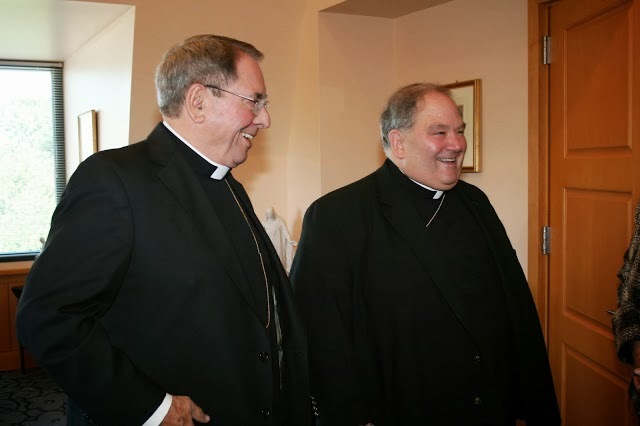 In New Orleans, meanwhile, the appointment leaves the venerable, 400,000-member archdiocese – 220 years old, but only now gifted with its first native son "really in charge" – without an active auxiliary for the first time in nearly half a century. 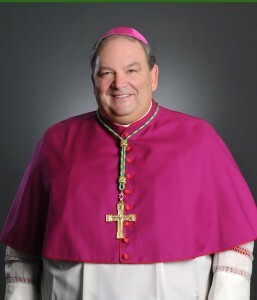 In Houma-Thibodaux – whose official diocesan history pointedly includes the Saints’ 2010 Super Bowl win – the diocese’s fourth bishop succeeds one of the more catholic characters of the bench: over his episcopal ministry, Jacobs has simultaneously served as the formal ecclesiastical liaison to both Legatus, the fairly traditional lay apostolate for Catholic CEOs founded by Domino's Pizza/Ave Maria's Tom Monahan, and the church’s branch of the Charismatic Renewal. As Jacobs marks both his golden jubilee as a priest and silver as a bishop next year, given said broad reach, the liturgical celebration of the milestones should make for quite the event. In an unusually quick turnaround, Fabre’s installation is slated for 30 October – five days after his 50th birthday – in Houma. The standard Appointment Day presser is slated for 9am Central time, followed by a Mass. 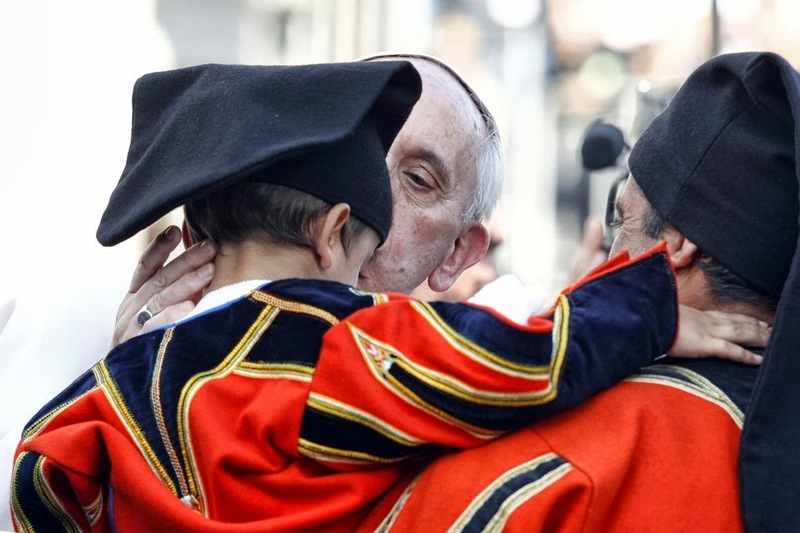 As Francis’ full drill into administrative matters continues apace, the Pope opened this Appointment Season with two other US shifts last week. First, after a 20-month apprenticeship, Bishop Cirilo Flores finally came into the reins of the 1.1 million-member diocese of San Diego last Wednesday, succeeding Bishop Robert Brom as the two-decade incumbent’s resignation was accepted on his 75th birthday. A Stanford Law grad ordained a priest at 43 after a decade in private practice, Flores (above), now 65, inherits one of the most abuse-rocked postings in the US church; after California’s 2003 “window” law suspending the state’s statute of limitations on civil suits, the diocese entered Chapter 11 bankruptcy in the wake of a $198 million settlement, the second-largest payment to survivors made by any American see or religious order. On a related note, while the statute halt cost the California dioceses a total exceeding $1 billion a decade ago – a torrent topped by the mammoth $660 million package in the archdiocese of Los Angeles – the specter of a second round is currently afoot. Despite a concerted effort by church leadership, earlier this month the state legislature passed a bill providing for an encore of the one-year period allowing for civil litigation to be filed regardless of when the alleged abuse occurred. The bill has been sent for Democratic Gov. Jerry Brown’s signature; the onetime Jesuit novice has until mid-October to enact it. Should Brown proceed, the second “window” would reopen on January 1st. And lastly, on Friday the pontiff brought Bishop Donald Kettler of Fairbanks back to the Lower 48 as bishop of central Minnesota’s St Cloud church – a turf roughly 7.5 percent the size of the 410,000 square-mile behemoth (by territory, the nation’s largest diocese, encompassing an area almost equivalent to Texas and California combined) which the 68 year-old Minnesota native had shepherded (largely via plane) since 2002. 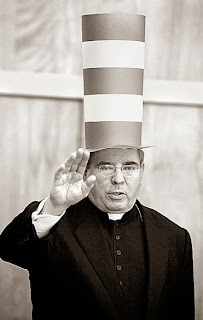 The tenth head of a diocese founded in 1889 as part of John Ireland’s post-pallium consecrating blizzard, Kettler succeeds Bishop John Kinney, who reached the retirement age of 75 in June 2012. Ordained a bishop at 39, Kinney was unable to be on hand for his successor’s introduction due to a hospitalization for an unspecified cause. Beyond being one of the most distinguished veterans of the bench, for many, he’s likewise among the most cherished; ergo, many prayers for his quick and full recovery. With the moves in aggregate, eight Stateside Latin dioceses now stand vacant, with another five led by (arch)bishops serving past the retirement age. Several other moves are said to be quickly in the offing, including reports of a possible surprise or two... and those barring whatever else an unpredictable Pope might just have in mind. 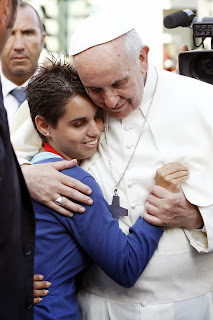 "Lord, We Lack Work" – In Cagliari, Pope Goes for the "Gold"
“Lord God, look down on us! Watch over this city, this island. Keep an eye on our families. Lord, for you, work wasn't lacking, you were a carpenter and were happy. Idols want to rob us of our dignity. Unjust systems seek to steal our hope. Lord, do not let us be alone. Help us to help each other; help us forget a little of our selfishness and feel in our heart an "us," a people that wants to move ahead. 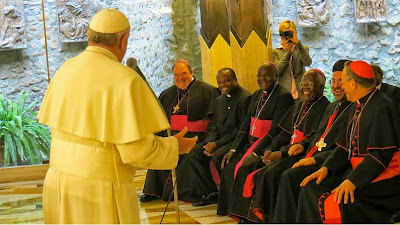 Earlier today, the Pope delivered the preceding spontaneous prayer at a "Meeting with the world of work" – his first event of the day on touching down in Calgiari, the capital of Sardinia, for a daylong visit marked throughout by multiple strong papal condemnations of inequality and the consequences of the global economic system in light of significant unemployment on the island. Intended principally as a pilgrimage to the isle's patroness, Our Lady of Bonaria – from whom Jorge Bergoglio's hometown of Buenos Aires takes its name – the Pope threw aside his prepared arrival text to castigate a world that he said had become "idolaters of this money god." "This isn't just a problem for Sardinia – strong though it is here," Francis said, "nor is it a problem just for Italy or some countries of Europe, but it's the consequence of a worldwide choice, of an economic system that brings this tragedy to bear; an economic system that has at its center an idol, which calls itself money." "Money rules! Cash commands!" Francis lamented, echoing a May address to diplomats on the same topic. "It rules over everything that serves him, this idol. And what happens? To defend this idol [man] piles everything in the middle and the edges [of life] fall away, the elderly fall away because in this world there's no place for them! ... And the young fall who can't find work and their dignity. "But think of a world where the young – two generations of young – don't have work," he said. "This world has no future." Handing his prepared text to the city's archbishop to be circulated in print, Francis explained going off-script by saying "I just preferred to say what was in my heart on seeing you all here." 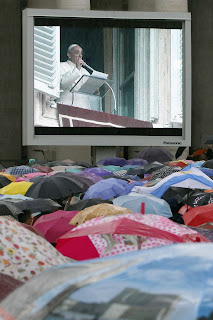 Prior to the talk, Francis was addressed by three workers: a factory laborer, an entrepreneur and a trade unionist. As the Pope recalled, the visit – his second Italian stop outside Rome – was likewise his second to an island, following July's emotional outing to the refugee haven of Lampedusa off the Sicilian coast, where the toll of the modern global economy was also conspicuously front and center. After an outdoor Mass at the Madonna's shrine, a visit to the cathedral to meet with representatives of the local poor and jobless, as well as a gathering with volunteer and charitable groups, the daylong trip wrapped up with an evening Q&A with young people. Opening the cathedral encounter by saying that "no one here is better than anyone else," Francis proceeded to speak in strong terms against those who – noting that all in attendance "have seen this" – show "arrogance in the service of the poor" and "instrumentalize [i.e. exploit] the poor for personal interests of their own group. "I know, this is human," the Pope said, "but it's not good! This is not of Jesus. And I will say even more: this is sin! It's a grave sin, because it's using the needy, those in need, who are the flesh of Christ, for my vanity. To use Jesus for my vanity: this is grave sin! It would be better if these people just stayed at home!" "This Is How It Is" – In Mega-Interview, Francis Lowers the Boom. Again. Another day... another gift from above – or, at least, Room 201 at the Domus. 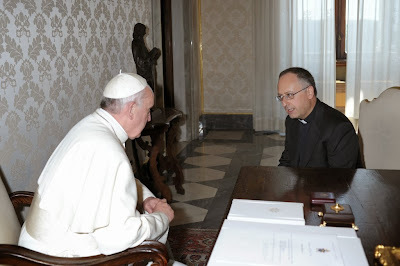 Early on in this pontificate, a caller to the office of Civiltà Cattolica – the authoritative Italian Jesuit journal vetted by the Holy See before it goes to press – asked to speak with the magazine's editor, Fr Antonio Spadaro. Spadaro was out, but the Pope tracked him down on his mobile. 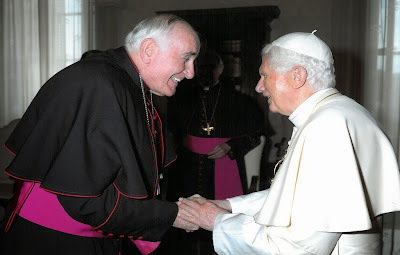 And now, the priest-scribe – above, with his confrere – has landed a coup for the ages: a 10,000-word interview with Francis published this morning by the 16 journals overseen by the Society of Jesus around the world. Beyond being merely conspicuous, the timing of the latest bombshell from the wildly candid Jesuit Pope effectively signals the start of Francis' full-bore dive into matters of governance and the church's internal life, a movement which will kick into top gear with Papa Bergoglio's inaugural meeting with his hand-picked "Super 8" commission of cardinal-advisers, scheduled for 1-3 October. Touching on issues ranging from sin, sexuality, the Curia and the pre-Conciliar liturgy to family, politics, books and film, the English rendering of the conversation – six hours in total, conducted over three sessions in August – is available via the UK's Thinking Faith and the US' America magazine. On its release today, Spadaro called the encounter "one of the most beautiful spiritual experiences of my life." Francis approved the original Italian text of the interview before its translation in the relevant languages. As the story begins to blow up the news-cycle, you will want to read the full text. Repeat: you will want to read the full text, so have at it. You know that the duty of the Conclave is to give a bishop to Rome. It seems that my brother cardinals have gone to take him from the end of the world, but here we are. And now, together, let us start this road: bishop and people, bishop and people. This [new] path of the church of Rome, which "presides in charity" [over] all the churches. A path of brotherhood, of love, of trust between us. Let us pray always for ourselves: one for the other. Let us pray for all the world, that we all might know a great fraternity. I wish you that this journey as Church, that we begin today and on which my Cardinal-Vicar [of Rome] will help me, might be fruitful for the evangelization of this beautiful city! Brothers and sisters, I leave you, but only for now. Many thanks for your warm welcome. Please pray for me often! I'll see you soon – tomorrow I want to go pray to Our Lady [Salus Populi Romani – her shrine at St Mary Major], because she's the one who cares for Rome.